NASA's Juno mission, led by Southwest Research Institute's Dr. Scott Bolton, is rewriting what scientists thought they knew about Jupiter specifically, and gas giants in general, according to a pair of Science papers released today. The Juno spacecraft has been in orbit around Jupiter since July 2016, passing within 3,000 miles of the equatorial cloudtops. "What we've learned so far is earth-shattering. 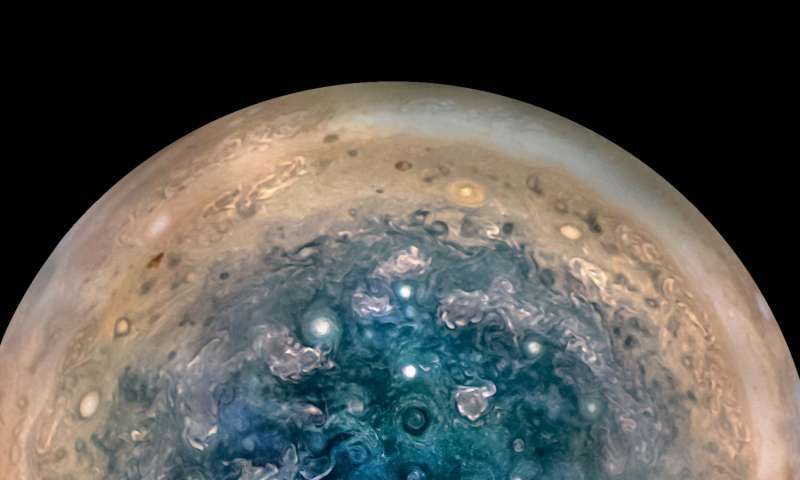 Or should I say, Jupiter-shattering," said Bolton, Juno's principal investigator. "Discoveries about its core, composition, magnetosphere, and poles are as stunning as the photographs the mission is generating." The solar-powered spacecraft's eight scientific instruments are designed to study Jupiter's interior structure, atmosphere, and magnetosphere. Two instruments developed and led by SwRI are working in concert to study Jupiter's auroras, the greatest light show in the solar system. The Jovian Auroral Distributions Experiment (JADE) is a set of sensors detecting the electrons and ions associated with Jupiter's auroras. The Ultraviolet Imaging Spectrograph (UVS) examines the auroras in UV light to study Jupiter's upper atmosphere and the particles that collide with it. Scientists expected to find similarities to Earth's auroras, but Jovian auroral processes are proving puzzling. "Although many of the observations have terrestrial analogs, it appears that different processes are at work creating the auroras," said SwRI's Dr. Phil Valek, JADE instrument lead. "With JADE we've observed plasmas upwelling from the upper atmosphere to help populate Jupiter's magnetosphere. However, the energetic particles associated with Jovian auroras are very different from those that power the most intense auroral emissions at Earth." Also surprising, Jupiter's signature bands disappear near its poles. JunoCam images show a chaotic scene of swirling storms up to the size of Mars towering above a bluish backdrop. Since the first observations of these belts and zones many decades ago, scientists have wondered how far beneath the gas giant's swirling façade these features persist. Juno's microwave sounding instrument reveals that topical weather phenomena extend deep below the cloudtops, to pressures of 100 bars, 100 times Earth's air pressure at sea level. "However, there's a north-south asymmetry. The depths of the bands are distributed unequally," Bolton said. "We've observed a narrow ammonia-rich plume at the equator. It resembles a deeper, wider version of the air currents that rise from Earth's equator and generate the trade winds." Juno is mapping Jupiter's gravitational and magnetic fields to better understand the planet's interior structure and measure the mass of the core. Scientists think a dynamo—a rotating, convecting, electrically conducting fluid in a planet's outer core—is the mechanism for generating the planetary magnetic fields. "Juno's gravity field measurements differ significantly from what we expected, which has implications for the distribution of heavy elements in the interior, including the existence and mass of Jupiter's core," Bolton said. The magnitude of the observed magnetic field was 7.766 Gauss, significantly stronger than expected. But the real surprise was the dramatic spatial variation in the field, which was significantly higher than expected in some locations, and markedly lower in others. "We characterized the field to estimate the depth of the dynamo region, suggesting that it may occur in a molecular hydrogen layer above the pressure-induced transition to the metallic state." These preliminary science results were published in two papers in a special edition of Science. Bolton is lead author of "Jupiter's interior and deep atmosphere: The initial pole-to-pole passes with the Juno spacecraft." 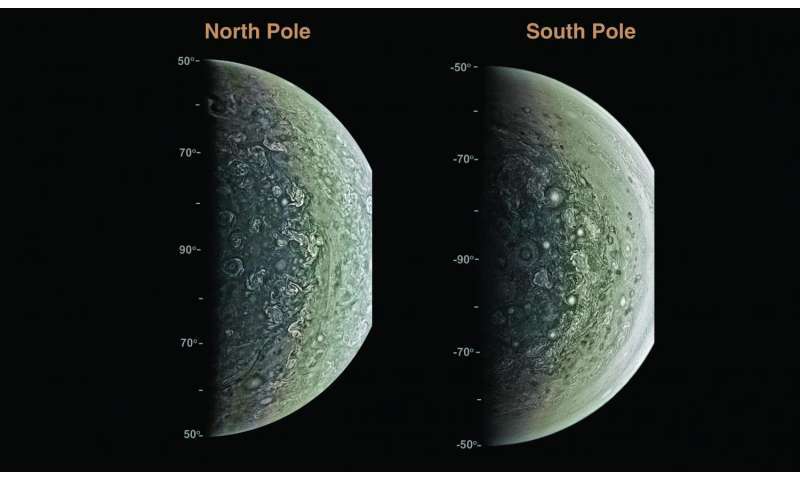 SwRI's Dr. Frederic Allegrini, Dr. Randy Gladstone, and Valek are co-authors of "Jupiter's magnetosphere and aurorae observed by the Juno spacecraft during its first polar orbits"; lead author is Dr. John Connerney of the Space Research Corporation. Juno is the second mission developed under NASA's New Frontiers Program. The first was the SwRI-led New Horizons mission, which provided the first historic look at the Pluto system in July 2015 and is now on its way to a new target in the Kuiper Belt. NASA's Jet Propulsion Laboratory in Pasadena, Calif., manages the Juno mission for the principal investigator, SwRI's Bolton. Lockheed Martin of Denver built the spacecraft. The Italian Space Agency contributed an infrared spectrometer instrument and a portion of the radio science experiment. What is the goal of Juno's mission to Jupiter?